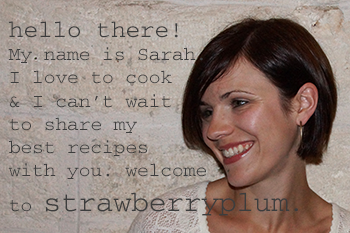 Sometimes this whole food blogging business can be downright painful. See, I’m sitting here at my computer, remembering what these blondies smelled like as they were baking…like buttery, caramelly, brown sugary goodness, straight from the heavens. And now instead of writing, I’m just staring at the crackled tops of these bars, thinking about their perfectly chewy edges and just how addictively sweet/soft/salty/crunchy/chewy they were . See, I’m remembering all of this. I made these over a week ago and now, as I’m finally getting around to writing about them, they are loooooong gone. I’m sitting here, tweaking photos, writing about these beauties, and they’re nothing but a memory. A beautiful, beautiful memory. It’s painful, I’m telling you. 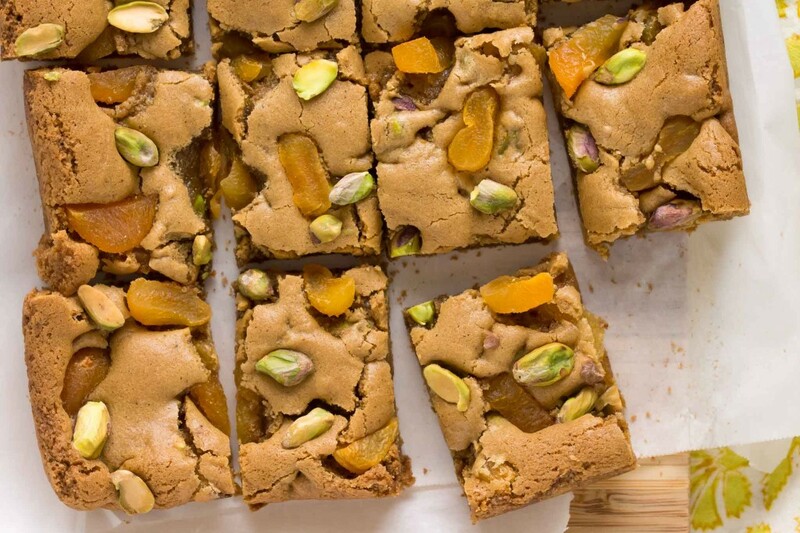 But, as difficult as it may be (mostly because my keyboard is now covered in drool), I’m going talk about these blondies because they were simply too good not to share. 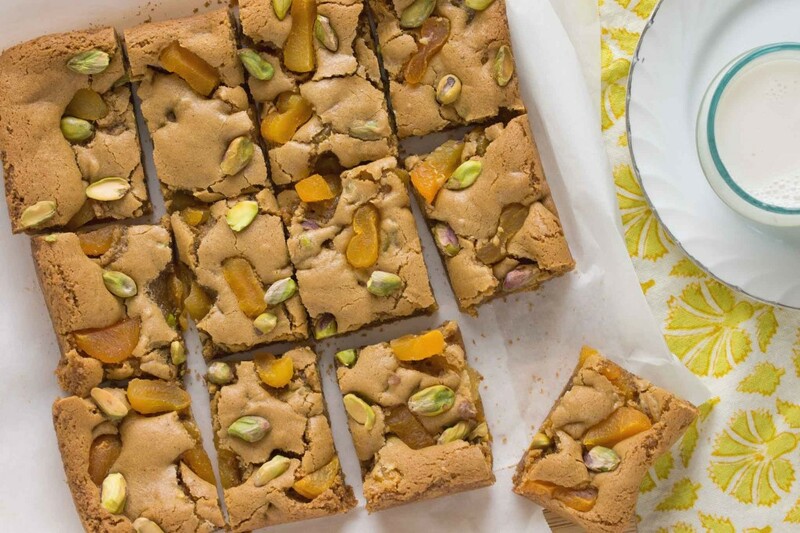 They’re just your basic blondies with a few special touches–browned butter, dried apricots, and a handful of salted pistachios. Those little extras are enough to transform a simple bar into an “I want to eat the entire pan right now” treat that I can’t get out of my head and soon you won’t be able to get out of yours. Consider yourself warned. These blondies go together in a snap. Brown a stick of butter while you measure out dry ingredients. Combine the butter with dark brown sugar, an egg, and a splash of vanilla. 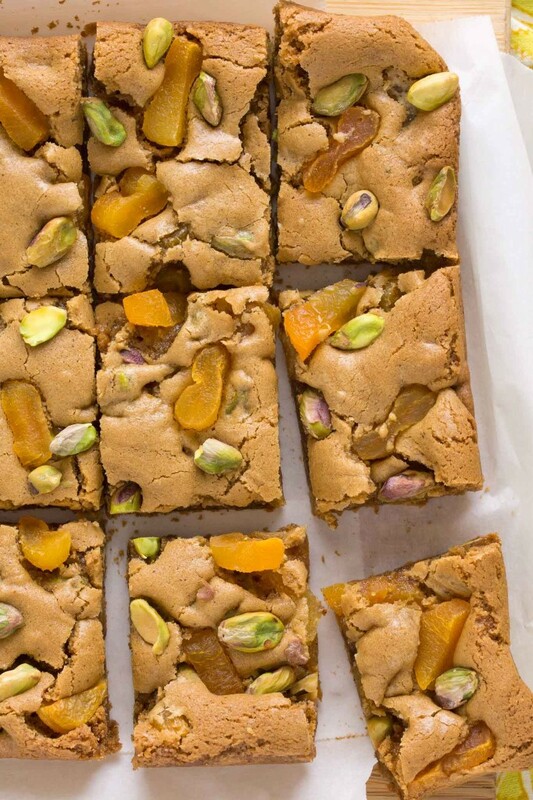 Stir the dry ingredients into the wet, then fold in some pistachios and sliced apricots. The batter will be thick and rich and really more brunette than blond. 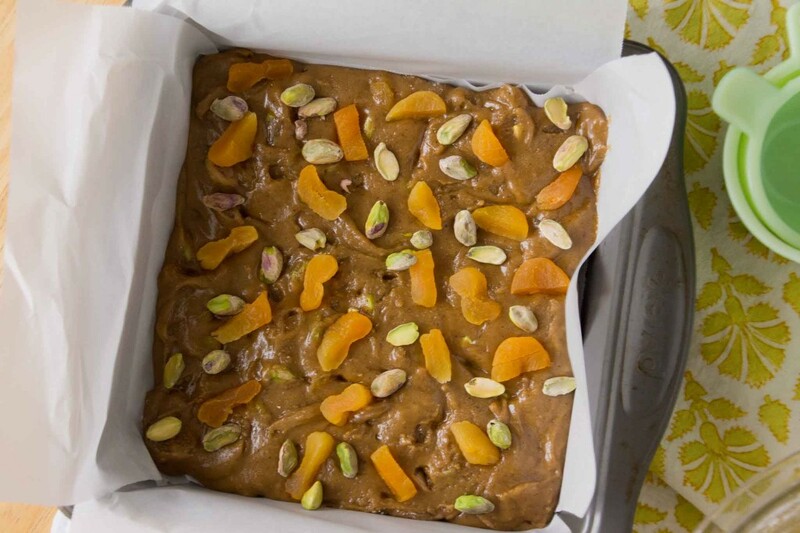 Smooth the batter into a square baking dish and scatter some more apricots and pistachios over the top. Get the pan in the oven and wait for your kitchen to start smelling like the most wondrous place on earth. Drooling? It’s okay, no one’s watching. Pull the blondies from the oven and let them cool as long as you can bear. These are wonderful still a little warm with a glass of cold milk. Or the next morning with a cup of coffee, or when you feel the need to “straighten the edges” mid-afternoon. I mean…I think. It’s been a week, after all–it might be time to refresh my memory. These bars are an addictive combination of flavors and textures--consider yourself warned! Preheat oven to 350°. Line an 8 in. x 8 in. baking dish with parchment or grease with butter and dust with flour. In a smallish bowl, whisk together the flour baking soda, and salt. 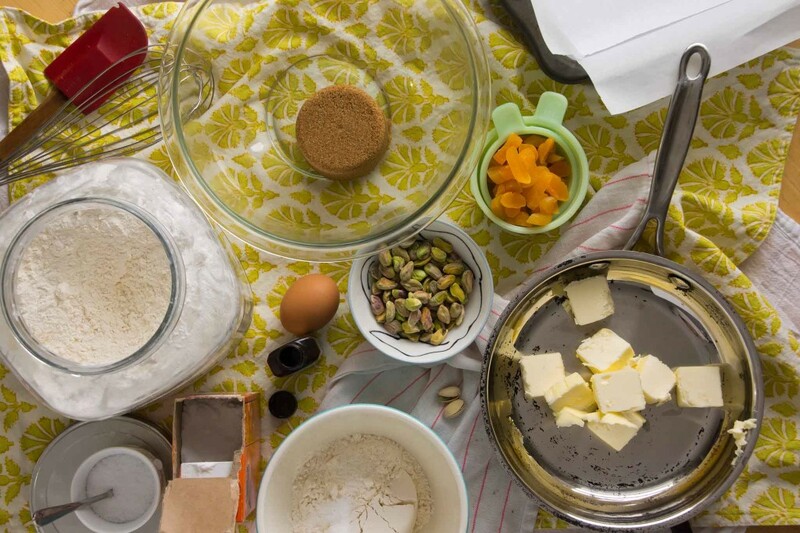 In a medium bowl, whisk together the browned butter and sugar. Whisk in the egg and vanilla. Add the flour mixture to the butter and sugar mixture and mix with a spatula until just combined. Fold in half of the pistachios and half of the apricots. Spread the batter in the prepared pan. 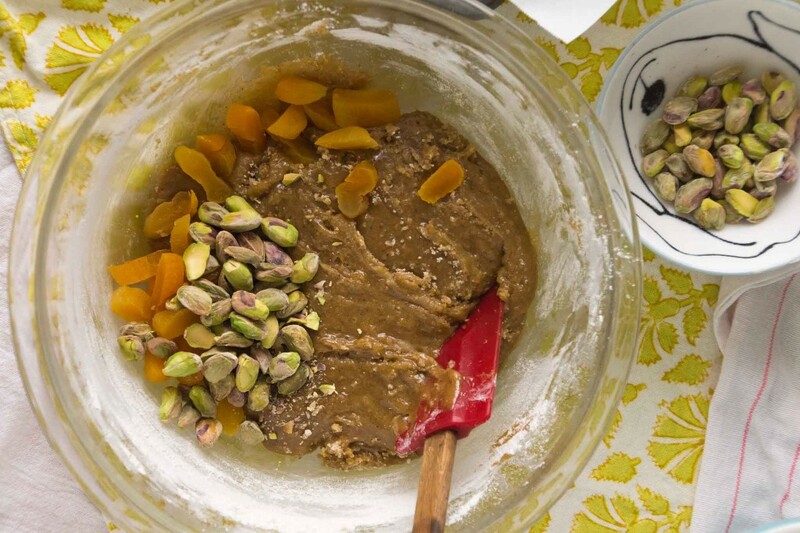 Scatter the remaining pistachios and apricots over the top and gently press with your palms. Bake until a tester comes out clean, 20-25 minutes. Allow to cool on a wire rack for at least 15 minutes before cutting and serving. How to brown butter: Cut a stick of butter into 8 or 10 pieces. Place the butter pieces in a small, light-colored (so you'll be able to see the color of the butter) pan and melt over medium heat. Once the butter has melted and the foaming has subsided, continue to cook over medium heat until it is light brown and smells nutty. Watch it carefully as it can go from brown to burnt pretty quickly! You had me at apricot. then pistachios. then brown butter. and of course at blondies! These look and sound amazing. I had Indian naan about a year ago that had dried cherries, pistachios, and apricots. Since then, this combination has been ingrained in my mind, so these are just what I need to make!